Menu editors cannot apply "move" to Mint Menu applications. Mozo can show, hide and rename applications. Alacarte was downloaded after I noticed this problem, as it seemed like a possible solution. Editing an application's name in Alacarte doesn't update in Alacarte or the Main Menu and does not output anything in the Terminal. "Move" buttons are clickable but don't do anything, and don't output anything in the Terminal. How can I customize the placement of my applications in the Main Menu? I have found that by replacing the mintMenu menu/item in the panel with a Main MATE Menu, my changes in the Mozo menu editor are actually applied. Right-click Panel for pop-up menu. Click "Add to Panel" in pop-up menu. In "Add to Panel" window, select the Main Menu item (descriptor: "The main MATE Menu"). Use "Add" button to add the Main Menu to Panel. 5.1. For each panel item that is in between the Main Menu and the desired location for it: right-click and make sure "Lock To Panel" is unchecked. Right-click the Main MATE Menu item and choose "move". 5.2. Move the item with the mouse, at the desired location, then click a second time to let the item go. 5.3. Check/re-check any items that you wish to have locked on the panel. Remove the default mintMenu menu by right-clicking it and clicking Remove From Panel. Right-click Main MATE Menu and open Edit Menu. Check contents and order of Main MATE Menu and Menu Editor to make sure everything is displaying how it should. I hope that if anyone else has the problem I had, this solution will work for them. Not the answer you're looking for? Browse other questions tagged ubuntu linux-mint mate-desktop menu user-interface or ask your own question. Why don't all Mint 12 applications show up in my cairo-dock menu? 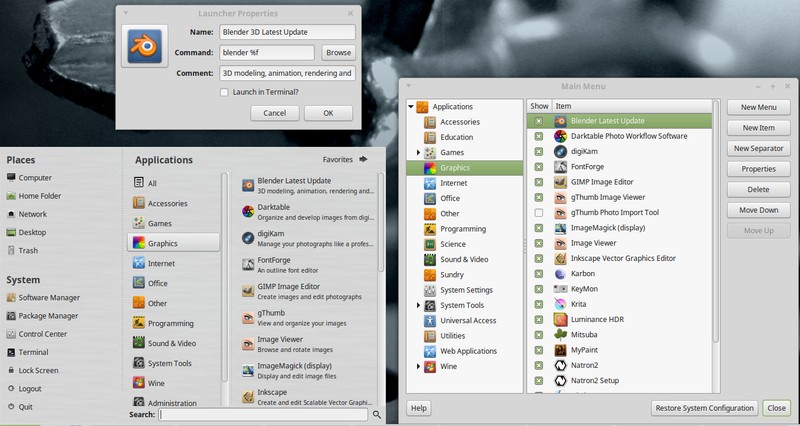 Linux Mint: How to disable or remove applications comment from favorites menu? Mate menu (Linux Mint 17) searches files when pressing enter - can this be changed?